A LITTLE REPORT FROM GHALI MÄSTERSKAPEN 2012! For the second year in a row I arranged Ghali Mästerskapen in Bloodtracking. This year the weather gods was not on our side! Rain as we drove up on Friday and the rest of the weekend looked the same rain and more rain:(. But we had a nice weekend anyway! Me and Lotta arrived at Stenlidens B&B in the evening and met up with Yeba´s litter sister Salma and Maria & Johnny. Very tired we all went to bed preparing for the big competition the next day! This year we were not as many as last year, for various reasons. On Saturday morning it was up early. At 9 am we were all heading for the woods and the competition! Today we were joined by Eldar, Houdini, Athena and Esther from the E-litter,and Esther´s big sister Stella. First out was "Athena" Ghali Excellent Kitty, she got to do her aptitudetest. And she passed her test easily! Then it was time for Salma and Yeba from our D-litter. And Eldar and Houdini from our E-litter. It was such a long time ago that Yeba got to track for "real" it was her first time tracking with blood since last year. She had some trouble knowing what to doL so it resulted in her getting a 2nd prize.Same thing for Houdini,he and his mum need to practice more for next year! Esther and her big sister Stella only trained to track, they got to learn more. Salma did a great job and recieved a 1st prize. After her it was Eldar´s turn and he did really great! 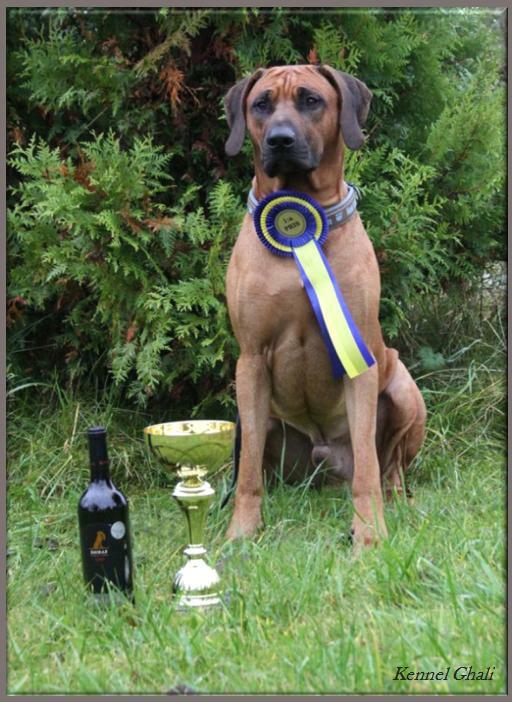 He received a 1st prize with HP:) and WINNER in Ghali Mästerskapen 2012! On Sunday most of the day was spend in the wood.Some wanted to do one more track and some just wanted to learn more about tracking! Thank you all for a great weekend and congrats to your nice results! Hope to see you and more of the Ghalidogs at next years competition 2013!